The sensitivity is 100 times better than the competitive instruments. The SM-30 is truly shirt pocket-sized instrument. With dimension 100 x 65 x 25 mm and weight 0.180 kg. SM-30 outperforms competitors 3 times. Thanks to sophisticated signal processing the noise induced in pick-up coil is suppressed well under resolution 1 x 10-7 SI units. The sensor design enables to get 90 % of its signal from the first 20 mm of the rock. This feature allows more accurate readings on uneven surfaces of all rock types. Auto-ranging and three-button control makes the meter the easiest to operate by one hand only. Internal memory can store 250 readings. One-year warranty is included in the price. We offer 48 hours turnaround support and repair service for any instrument sent from any location worldwide. Subsequent customer support is provided. The SM-30 is small magnetic susceptibility meter. Thanks to the high sensitivity we can measure sediments and rocks with extremely low level of magnetic susceptibility. In addition, we can distinctly measure diamagnetic materials like limestone, quartz and also water. The SM-30 is controlled by three push buttons. One of them serves to save up to 250 measured values into nonvolatile memory and to recall them later. The 251th value (the last measured one) is automatically displayed after SM-30 is switched on. If no button is pressed for 3 minutes, the instrument switches off automatically. 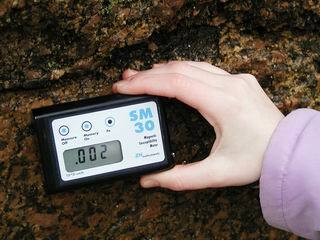 The SM-30 has a beeper indicating intervals in which the information from the rock is picked-up. The SM-30 is powered from two coin lithium batteries CR2430. If the instruments is not used too extensively, the batteries may last for years thanks to their low self-discharge. the coil is removed tens of cm away. The SM-30 offers four measuring modes. Three of them compensate the linear part of the thermal drift. The large number of the memory registers (250) is useful especially when scanning mode is used. Though the instrument is small, the pick-up coil is large enough in diameter to measure sufficiently high volume. PC software for data transmission and for external control. 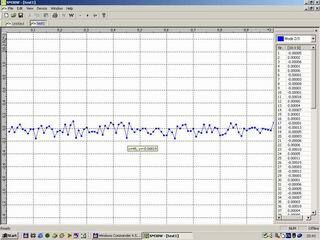 The measuring by SM-30 is done in 15 second intervals. Measured data is transmitted to the computer with the resolution 1 x 10-8 SI units. The test was done with the programmer SM-30w, which is included in standard supply accessories. simple operation without any control knobs. Operation of the SM-100 is straightforward. Typically a small sample in a plastic vessel is placed into the measuring coil for analysis which is carried out under instructions from a personal computer. The SM-100 is connected to a PC with a cable to serial RS232 port. Results are available in several seconds and are conventionally stored and displayed on this PC. Flexibility and user friendliness have been the key criteria in the design of the SM-100 software. Calibration samples are supplied. Checking the calibration takes only a few minutes. We focus on providing 48 hours turnaround support and warranty repair service for the instrument sent back from any location worldwide. 기기개량으로 인하여 사양이 변경될 수도 있습니다. The sensitivity is 10 times better than the competitive instruments. The SM-20 is truly shirt pocket-sized instrument. With dimension 100 x 65 x 25 mm and weight 0.128 kg. SM-20 outperforms competitors 3 times. Thanks to sophisticated signal processing the noise induced in pick-up coil is suppressed well under resolution 1 x 10-6 SI units. Auto-ranging and two-button control makes the meter the easiest to operate by one hand only. Internal memory can store 29 readings. The SM-20 is small magnetic susceptibility meter. Thanks to the high sensitivity we can measure sediments and rocks with extremely low level of magnetic susceptibility. In addition, we can distinctly measure diamagnetic materials like limestone, quartz and also water. The SM-20 is controlled by two tactile-feedback push buttons. One of them serves to save up to 29 measured values into nonvolatile memory and to recall them later. The 30-th value (the last measured one) is automatically displayed after SM-20 is switched on. If no button is pressed for 3 minutes, the instrument switches off automatically. The SM-20 has a beeper indicating intervals in which the information from the rock is picked-up. The SM-20 is powered from two coin lithium batteries CR2430. If the instruments is not used too extensively, the batteries may last for years thanks to their low self-discharge.